I have always loved ‘doing up’ old things. There is something very satisfying about giving new life and love to something that was deemed worthless. Being a visual thinker, I can imagine what that old piece of furniture will look like when I take it from the side of the road and work some magic. I see potential, even when others do not. My current project is a chair. What excited me most, was the possibility of doing a tapestry seat cover. I could see the finished product sitting in my living room and to this end I’ve been motivated. 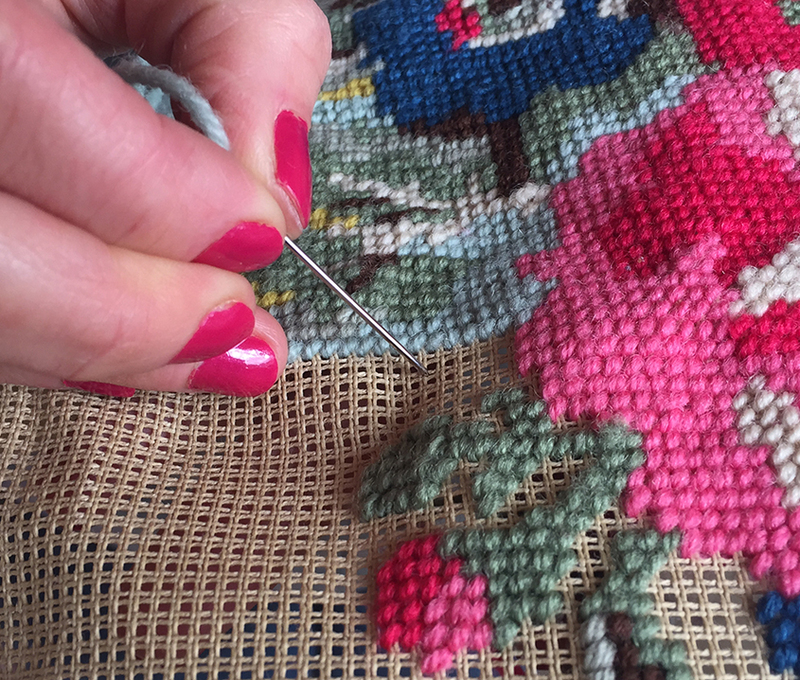 If you’ve ever done a tapestry, or seen one up close, you’ll know that the overall picture is made up of hundreds of connecting stitches. There are no gaps; every inch is filled with woven colour. I like to begin a picture with the most interesting, colourful part. A place that will quickly show form and distinction. It’s exciting to piece together lots of different colours and have the instant gratification of seeing what your picture is going to look like, against the initial, dull background. While I find pleasure in this, the fact still remains, I must at some point begin work on the boring, monotonous background. When I say ‘work’, I mean hours. Rows and rows of unchanging colour. It is at this point I want to give up; I want to go back to the good bit. However, for the tapestry to be complete, I must be dedicated to doing what is hardest, even when it means finding little pleasure in my job. Recently, it occurred to me that just like my approach to the tapestry, so can my approach to life be. I look forward to the opportunity of excitement and variety. I take pleasure in doing things that I can see value and worth in; the parts of life that bring recognition and praise. It is easy in these times to rejoice and say thank you to God for all the good things he bestows. There is something very fulfilling when we see God working through us and in us. While God in his kindness, generously gives us occasion and scope to enjoy life; there is a whole heap of life that is mundane and hard work. My father refers to it as the ‘nitty gritty’ of life. The simple fact that most of life is unseen and unsung, but oh so important. Being a mother has made me appreciate this truth. There are many lonely hours, where no-one sees my effort and my tears. The mundane jobs that no-one else wants to do, fall on me, and my good intentions get lost in the crazy. However, these unglamorous tasks make up an important whole. It would be tempting to view them as inferior or an inconvenient job that no-one would miss if I chose to apply myself half heartedly (or even skipped altogether). However, in thinking this I miss out on the wonderful opportunity to lean into God; to acknowledge that I can’t do it on my own and I need his help. Leaning on God affords me the experience of God being enough and the pleasure of working for him; for he sees my heart and all my work. When I see all of life as an offering to him I am able to remain faithful in these small tasks. What follows: a deeper joy. Not just for the exciting, colourful times of life, but the mundane, often difficult, background work. As I have written these words this week, I have been sorely tested in the truth of what I say. I admit there have been days where I have failed to joy in the struggle and have wished to escape circumstances and find solace in ‘fun’. While there are days I know my attitude could have been more Christ-like, how glad I am for each new day. God’s forgiveness, mercy and grace are gifted upon me. So as I press on, I am encouraged. Each day, each challenge, each opportunity is weaving together the tapestry of my life. One day the tapestry will be complete, but most importantly I want that tapestry to be a reflection of God’s handiwork.